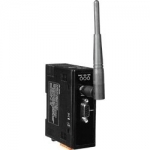 ZigBee modems are designed to offer wireless data transfer in the industrial environment. ZigBee also supports network redundancy. For assistance in choosing the right products for your application, please contact us. ZigBee Host to Serial (RS232 or RS485) converter module. Connects to the host computers serial port to provide a wireless interface to other modules from the ZB series. ZigBee Slave to Serial (RS232 or RS485) converter module. Enables Serial devices to be wirelessly connected to a host computer (using the ZT-2550 at the host end).